Celebrate with the stars! Have a movie party at Showcase Cinemas! Does your child love going to the movies? Picture them enjoying their birthday party with family and friends in a Showcase Cinema theatre with movie theatre popcorn, refreshing drinks in reserved seats with the movie of their choice. So fun! 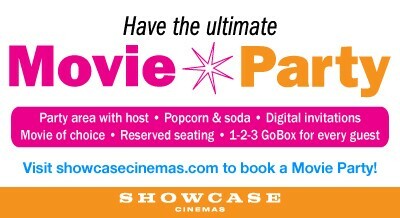 Reserve a MOVIE PARTY today and let Showcase do it all! For reservations and pricing, please contact your local Showcase Cinemas theatre. Terms and Conditions: Minimum size party of 10, maximum size, party of 20. Refreshment Combo of unlimited popcorn and soda during allotted time in exclusive party area. National Amusements cannot guarantee availability of G, PG, or PG13 rated films at individual locations. Parties must be reserved a minimum of three (3) days in advance. Movies are subject to change and or last minute cancellation. Do you have a child in your life who loves to go to the movies like my kids do? Sign them up for the Popcorn Club! You can register for Popcorn Club online. Once registered bring receipt to participating theatre to receive your Popcorn Club backpack and movie prize pack. Registration is also available at Guest Services at participating theatres. 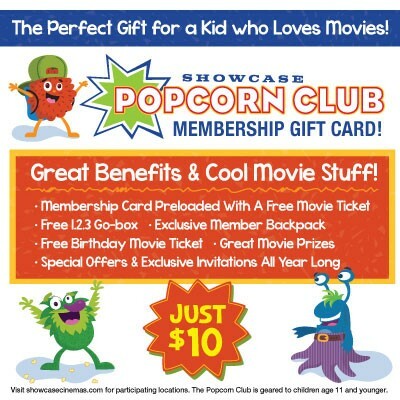 Parent or legal guardian must complete the registration and by doing so agree to The Popcorn Club Terms & Conditions. Children must be 11 years or younger. Membership is $10.00 per child. New member prize pack retails for $35.00. To Contact Popcorn Club Email:popcornclub@showcasecinemas.com. WE LOVE GOING TO THE MOVIES AND WE ARE EXCITED TO BE PART OF THE CLUB!